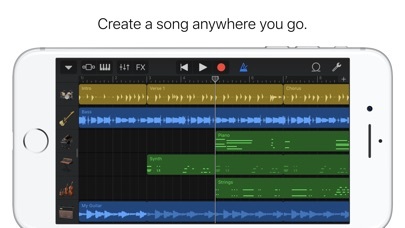 GarageBand turns your iPad, and iPhone into a collection of Touch Instruments and a full-featured recording studio — so you can make music anywhere you go. 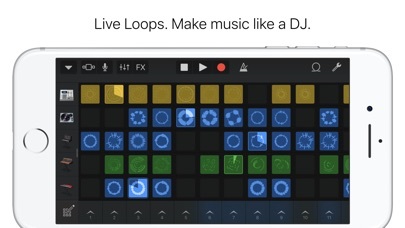 And with Live Loops, it makes it easy for anyone to have fun creating music like a DJ. Use Multi-Touch gestures to play keyboards, guitars, and create beats that make you sound like a pro — even if you’ve never played a note before. Plug in a guitar or bass and play through classic amps and stompbox effects. Use a Touch Instrument, microphone, or a guitar and instantly record a performance with support for up of 32 tracks. Use the new Sound Library to download additional free instruments, loops and sound packs. Audio Unit Extensions in iOS 11 allow you to play, record and mix third-party instruments or effects right into GarageBand. And then share your song with friends and family. Live Loops. 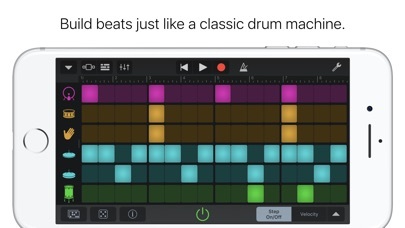 Make music like a DJ • Use Multi-Touch to tap and trigger a Live Loop cell or group of cells • Get started with templates or build your own grid from scratch with Apple Loops • Create custom loops by recording directly into a cell using any Touch Instrument • Use Remix FX to perform DJ-style effects • Tap record and capture your performance Play your iPad, and iPhone, like a musical instrument • Play a variety of musical instruments on the innovative Multi-Touch keyboard • Play and record using the Alchemy synth* • Build grooves inspired by classic electronic drum machines with the Beat Sequencer • Download free instruments, loops and sound packs for GarageBand with the Sound Library • Capture any sound and apply studio-class effects • Recreate legendary guitar or bass rigs using virtual amps & stompboxes • Use 3D Touch to play keyboard sounds with polyphonic aftertouch** • Record performances from third-party music apps directly into GarageBand using Audio Unit Extensions*** Drummer for iOS • Add virtual session drummers to your song who take direction and play realistic grooves • Choose from acoustic, electronic drummers and percussionists**** • Each character provides their own sound and the ability to create over a million realistic grooves and fills Sound like a virtuoso with Smart Instruments • Play an entire string orchestra using Smart Strings • Perform with Chord Strips and autoplay using any keyboard instrument • Groove with a variety of Smart Basses using upright, electric, and synth sounds • Strum chords or trigger autoplay patterns on an acoustic and electric Smart Guitar Create a song anywhere you go • Record, arrange and mix your song with up to 32 tracks using Touch Instruments, audio recordings, and loops***** • Record multiple times over any song section and choose your favorite using Multi-Take Recording • Use professional mixing effects, including Visual EQ, Bitcrusher, and Overdrive • Recording, mixing and exporting a song can be done at 24-bit audio resolution • Trim and place musical regions exactly where you want them to play • Automate the volume and record the movement of controls on Touch Instruments • Add comments or lyric ideas to your song with an integrated notepad Share your songs • Keep your songs up to date across all devices using iCloud Drive • Create custom ringtones and alerts for your iPad, iPhone, or iPod touch • Share your songs using email or Facebook, YouTube, and SoundCloud****** • Remotely add new tracks to your Logic Pro X project from your iPhone or iPad via iCloud * The Alchemy synth is available on iPhone 6 or later, iPad Pro, iPad (5th generation), iPad Air 2, and iPad mini 4. ** Polyphonic aftertouch is available on iPhone 6s or later. *** Requires compatible third-party Audio Unit Extensions apps from the App Store. 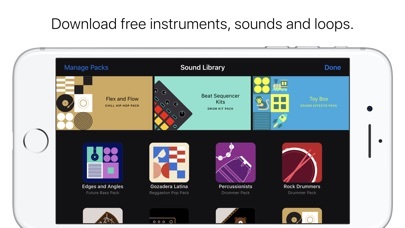 **** Requires free download from GarageBand Sound Library. ***** Multitrack recording requires a compatible third-party audio interface. ****** Sharing to Facebook and YouTube requires iMovie. Add more hip hop packs like another trap one and maybe an old school type pack too with keyboards and stuff for melodies please! Garage band feat. New ones I love that Only one you can make brass, add more improvements of world and something new to tryout! Needs more instruments and instrument creating interface, but great app. This app is great for anyone; whether you’re just messing around, or if you’re a serious musician that needs portability in their work. Its pre-packaged sounds and free sound packs provide relative musical versatility along with the built in mixing options and editing tools. Its only downsides are that the instruments are provided mostly designed with a pop genre “sound,” if you will, and also that you can’t make custom drum kits to achieve a specific sound that you might want to have. The sampler piano, although useful in some cases, relies on microphone quality of the device you use, and aside from tone editing and sound shaping, the sample may very well stay as staticky as your microphone provides. 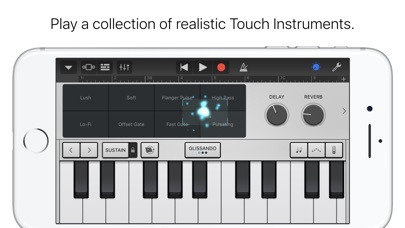 All in all, the app is great as long as you want to make music with the instruments provided. However, if you want to diversify, I wish you the best of luck making a decent instrument from scratch. Love the Roland Drum Machine addition! Good app I’m having problems uploading my music to other apps. Can you tell me how to do it correctly because everything I try doesn’t work and I really want to give it five stars and I will once I figure out the problem. First, the pun in the title was intended. Second, this app is amazing and free! If you have not downloaded it, you should! Thank you, Apple!